An abrupt market drop causes a rally in gloom-n-doom hypotheses. More than a few that landed in my inbox recently focused on the relationship between corporate profits and GDP. The core theme was this: corporate profits as a percentage of GDP exhibit a mean-reverting characteristic. Whenever they overshoot too far from the mean, they fall back; and this isn’t good for long-term equity returns. Current levels are close to historical highs, so equity bears invoke the above to build a bear case. Historical references cite the peaks hit in 1965/66 and 2006 as strong evidence for weak subsequent equity performance. History provides some insights. The following exhibit uses after-tax corporate profits from NIPA and uses the Dow Jones Industrial Average as a barometer of equity performance. The DJIA was chosen as a longish history of prices was readily available. For comparative purposes, a similar exhibit for the S&P 500 is appended later. 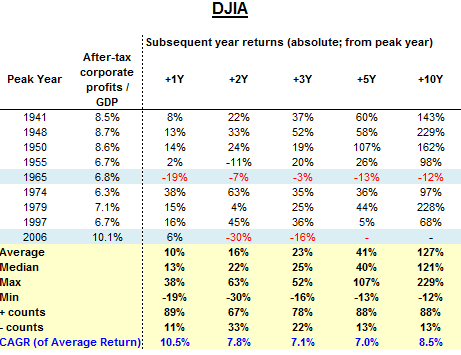 Only 2 out of the previous 9 occasions have been dreadful for long-term equities. The 1965/66 peak (the so-called Kennedy-Johnson peak) was followed by a long period of negative equity market returns. Something had changed on this particular occasion compared to previous instances. The 2006 peak seems to be (so far) tracing the 1965 pattern. Indeed, in terms of performance, the latest instance is unprecedented. The S&P 500 shows a similar pattern, except that the 1965 peak exhibited some divergence with the DJIA’s performance over the 2 and 3 year time frames. The 1997 peak preceded a decent show by equities over the typical time frames that a majority of market participants inhabit (1-3 years). 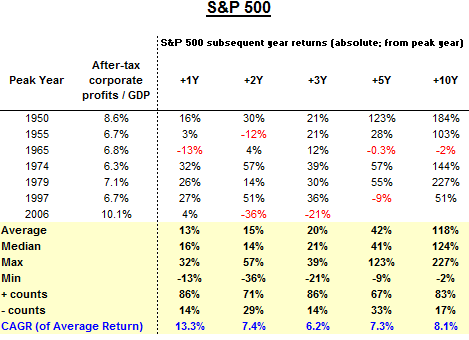 Given the above, the equity-bears’ argument for selling equities on the premise of historically high corporate profits/GDP necessitates a closer look. One went about searching for the missing pieces that could complete this jigsaw puzzle somewhat, and zeroed in on some metrics that to have a bearing on equity performance. Metrics included Robert Shiller’s cyclically-adjusted P/E ratio (CAPE; real S&P 500 price divided by last 10-year average real earnings), 10-year US Treasury yield, AAA corporate bond yields and inflation (CPI). Ceteris paribus, a high starting CAPE accompanying peaks might be posited to set the stage for weak subsequent returns. High valuations and high profits relative to GDP would imply that most of the positives were already priced in by market participants; and slip-ups on profitability would be perceived unkindly. In investing, very often, the path taken to arrive at a signpost has a strong influence on future course of events. The exhibit below presents a 10 year picture; 5 years prior to the peak year and 5 years subsequent to the peak year. Cut to 1965: At the cusp of 1965, the market came off a period of low inflation and general prosperity in the 50s and 60s. Optimism buoyed by President Kennedy’s election in the early 60s, and followed by President Johnson’s Great Society program, stoked a rally in equities. And then the Vietnam War escalated, degenerating into a deadlock, ultimately entering the history books as a costly indulgence. Johnson’s Great Society dream would remain a dream and inflation worries increased as a result of the war, puncturing investor confidence. Proving market participants’ right, inflation inched up through the 60s and 70s. 10-year Treasury yields inched up through the same period. It appears that a high starting P/E + corporate profits / GDP peak + high inflation + rising bond yields in the post-peak period set the stage for weak equity performance. Some caution is warranted, however, before forming a provisional conjecture. Post-1941 performance dents this hypothesis. The World War II peak was followed by a rise in inflation. Through 1941, average P/E was reasonably high and inflation was low, similar to 1965. Ensuing equity performance was strong, however. High valuation + peak + high inflation had not succeeded in keeping equity returns in check. The outcome is interesting considering that average inflation was higher post-1941 v/s post-1965. The post-1974 performance was similar in behaviour to post-1941. Things get more intriguing here as average inflation was high both before and after the peak year and bond yields were well on their way to multi-decade highs. Yet, equities did okay. By 1997 investor optimism was running high again and the CAPE was at elevated levels relative to history. Inflation was low and bond yields had been trending down over the past 15 years. This peak, however, was followed by a tepid show for equities over the medium/long-term. Cut to 2006. CAPE was high, inflation and bond yields were reasonable. But ensuing equities performance has given no cheer whatsoever (so far anyway). In a nutshell, equities do not bear a consistent static relationship with inflation or bond yields at all times. Valuation levels, however, are a different matter. But writing equities off because corporate profits / GDP are at peak is a little simplistic, in my opinion. Another important factor that these periods share is investor sentiment. Psychology plays a pivotal role in determining future outcomes and is, unfortunately, the least considered variable. The character of investor sentiment changed post-1965 due to a multitude of factors (Vietnam War inflation, Cold War etc. ), resulting in bearishness, and was probably a contributory influence in keeping returns down. The vicissitudes of the human mind has trumped cold reality repeatedly through history. Could this time be different? A summary of the present: Corporate profits / GDP are presently at elevated levels relative to history, inflation is reasonably high considering the recessionary backdrop and bond yields are at historically low levels with little room to fall further. Are equities doomed, or does this represent an attractive entry point? Considering the above exposition one is reluctant to proffer a conjecture. It seems a better proposition to dwell on individual businesses rather than participating in a broad index. High dividend yield equities combined with low dividend payout ratios in industries that are relatively recession-resistant is a theme that the mind is drawn to. Sometimes, history accentuates an investor’s Uncertainty Quotient. It’s a bittersweet feeling. Schizophrenic markets do not help either.